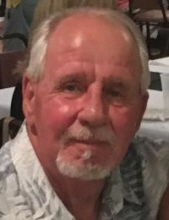 WEST FRANKFORT- James Wayne “Jim” Ramsay, 71, passed away unexpectedly Friday, February 1, 2019, at his longtime home in West Frankfort. Jim and wife, Debbie, made their longtime home and raised their family on the corner of St. Louis and Mulberry Streets in the same location where he grew up. Neighbors and passersby could often see Jim enjoying retirement in his garage with the St. Louis Cardinals game on the television, steaks on the grill and a cold Pabst Blue Ribbon in hand. Jim graduated from Frankfort Community High School in 1965 graduate and then McKendree University in Lebanon. After graduating from college, Jim managed several Belscot department stores in Chicago and Galesburg before returning to West Frankfort to take a job as a U.M.W.A coal miner at Old Ben #21 near Sesser. He worked in many capacities in the southern Illinois coal mines during his long career which ended in retirement in 2009.During the 1980s and 90s, Jim spent many nights coaching baseball at the Frankfort Community Park, where he was also board member. Him and Debbie were FCHS Redbird fans, holding season basketball tickets at Max Morris Gym for many years. Jim spent many nights rooting on Illinois Fighting Illini basketball. He was also an avid bass fisherman, enjoying many days on the water at Cedar Lake. However, his true passion was St. Louis Cardinals baseball. During baseball season, Cardinals would be on multiple TVs throughout the house as well as Mike Shannon’s voice calling the game on the radio. For his 55th birthday, he treated himself to his first and only tattoo—the world famous “STL” logo on his right arm.During retirement, Jim and Debbie spent many weeks enjoying the beach in Gulf Shores, Ala. They made memories with friends and family during these vacations, relaxing in the sand and enjoying the local seafood joints.He remained very close to his FCHS Class of ‘65 classmates. They often met for lunch and he always looked forward to each class reunion. Jim was also proud to be a member of the 1965 state-qualifying Redbird track and field team. He was South Seven Conference champion in the low hurdles and remained a school record holder in the event. Jim is survived by his wife of nearly 40 years, Debbie; son, Philip, of Denver, Colo.; son, Aaron and wife, Kim, of West Frankfort, Ill.; son, Alec and wife, Amanda, of West Frankfort, Ill.; daughter, Jennifer and husband, Trenton, of Sesser, Ill.; grandchildren, Mady, Jessi, Lani, Lucas, Logan and husband, Austin; and “grandpups,” Frannie and Charlie. He was also survived by many special friends and family whom he loved dearly. He was preceded in death by his mother, Betty June, for whom Jimmy Wayne was the apple of her eye. His father, Alexander “Alec” Ramsay, was a WWII veteran who was killed in Orient #2 Mine explosion on Dec. 21, 1951. He was also preceded in death by his four-legged best buddy, Libby. Those whose lives were touched by Jim are invited to Union Funeral Home in West Frankfort on Tuesday, Feb. 5 from 5-8 p.m. to share memories, stories and tears. The funeral service will take place Wed., Feb. 6, at 11 a.m. Burial will immediately follow at Tower Heights Cemetery. In lieu of flowers, a donation fund will be set up to benefit the FCHS Redbird athletic program. To send flowers or a remembrance gift to the family of James Wayne Ramsay, please visit our Tribute Store. "Email Address" would like to share the life celebration of James Wayne Ramsay. Click on the "link" to go to share a favorite memory or leave a condolence message for the family.